Stillwell: A Haunting on Long Island by Michael Phillip Cash: A Book for the grownups! Horror-Suspense-Thriller story. 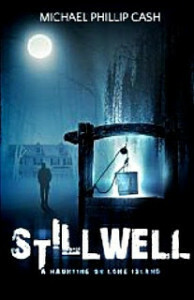 Stillwell: A Haunting on Long Island by Michael Phillip Cash A Book for the grownups! Horror-Suspense-Thriller story. Looking for a story not for the kids? I know I love reading and every once in a while I love to read a good story with suspense! I recently received a book called Stillwell: A Haunting on Long Island by Michael Phillip Cash and couldn’t put it down! I actually read it all in one night. It’s full of suspense! It starts out with the main character, Paul Russo’s wife passing away after being ill with cancer. Paul must not wallow in grief too long because he has to get his family back on track. But, is his wife’s spirit at peace? No, and it’s Paul’s job to figure out all the clues dating back hundreds of years to set his wife’s soul free. His fate is intertwined with an old haunted mansion called Stillwell Manor.Those who have lost a loved one, will relate to the emotions and the feelings of Paul.If you are looking for a great suspense thriller and a bit of a ghost story, this one is for you! You can find it at Amazon.com. Self Disclosure: I received this book to facilitate this review.